BlackVue DR550GW 2CH HD Digital Video Recorder (DVR) is a Twin Camera System for recording the front and rear view from the vehicle making it ideal for couriers, hauliers, taxis, fleet vehicles and independent drivers. The front camera records in full HD Video at 30 frames per second with a camera lens that is 2.0 a pixels CMOS sensor and records a 108 degree angle of the road ahead so you record the full scope of the incidents in the road ahead. The rear camera records in 720p HD quality. The DR550GW has an AV output for playback on a monitor. You can see your exact location on a Google map. You can also connect via WiFi to an iPhone or Android Smartphone. Playback can be done at speeds 0.1 to 2.0x. The BlackVue also records sound using a built-in microphone. There is also parking mode that detects motion and vibration to start recording events. BlackVue DR550GW 2CH has been discontinued. The BlackVue DR550GW 2CH HD is a compact, discrete in-car camera system which includes front and rear camera. It is GPS enabled and the front camera will record in full HD Video at 30 frames per second and the rear camera records in 720p HD quality. Video conversion is to AVI format. The in-car camera will also record your GPS speed. This video can then be used as evidence of events along your journey such as incidents for insurance purposes. The BlackVue records using a 108 degree lens that will capture a wide angle of the road ahead and road behind. The micro SD card included with the BlackVue DR550 is 16GB. 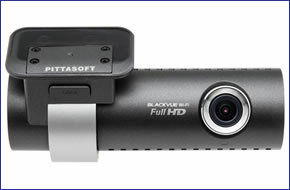 The DR550 has an AV out to connect the BlackVue to a monitor for playback. There is a built in google map which will display your journey on the road and you can find your exact location on the Google map. The BlackVue is WiFi compatible allowing you to synchronise to your Apple or Android smartphone and playback on the device. Playback speed is adjustable between 0.1 and 2.0x. The 550 will record sound using its built in microphone and shows an LED when recording is in progress. The BlackVue 550 will permanently record on a continuous loop. It also has a parking mode that will record when your vehicle is parked using a 3 axis G-Sensor that detects motion and records only when motion or vibration is detected saving recording time for when it matters. You can also use this sensor to record whilst driving to record only when vibration is detected such as in a collision. With the front and read cameras when your vehicle is parked you will get around coverage of your vehicle. Do you have a question about the DR550 that's not been answered on this webpage? Please see our Dash Cam FAQ's for questions from other people. If the answer to your question isn't featured, use the online form to ask us for the answer. Alternatively please telephone 01733 777623 Monday to Friday (9:30am-5:00pm) to speak to one of our sales team. For further information online please see the BlackVue dash cam comparison table. ‣Both front (2.4 Megapixel CMOS Sensor) and rear (1 Megapixel CMOS Sensor) camera for recording events in the road and when parked. Additionally, if you'd like to hardwire the BlackVue DR550GW HD dash cam into your vehicles battery, you can do so by purchasing the BlackVue Power Magic Pro electric power controller (which is sold separately). The Power Magic Pro will operate in cars, vans and other commercial vehicles with a battery power supply of either 12 volts or 24 volts. In addition, once installed the hardwire power kit enables your BlackVue dashboard camera to continue to operate even when your vehicles ignition is switched off.